Bloomington City Manager Tim Gleason says he'll send council members a memo clarifying the intent of a proposed asphalt and concrete budget line item. Bloomington aldermen passed the city’s $227.5 million spending plan Monday night, the largest on record, according to staff. The approved 8 percent increase in spending over last year’s budget includes $2.3 million staff expect the city’s higher gas tax to generate annually for road work. The budget includes plans to restrict funds from the now 8-cent tax to pay for asphalt and concrete projects. The original tax only restricted the funds for transportation-related projects. “The council’s made it very clear that this is to be used for asphalt and concrete, not just the new 4 cents, but the original 4 cents that was passed in 2014 and the quarter percent home rule sales tax,” City Manager Tim Gleason explained. That’s why the city proposed to create a new line item in the budget tracking revenue and spending on city streets and sidewalk projects. But the proposal was less than clear for aldermen; the council voted unanimously to table the proposal until its next meeting April 22. Alderman Kim Bray motioned to change the language of the proposal so that it specified the funds could be used for “asphalt and concrete” projects, rather than the broader “street resurfacing program, sidewalk repairs and transportation infrastructure” laid out in the proposal. Alderman Amelia Buragas said she’d like more time to discuss the consequences of enacting the more specific language, such as excluding brick streets that also need work. But Alderman Joni Painter argued brick streets weren’t included in previous council discussions, and shouldn’t be funded with local motor fuel tax dollars. Alderman Karen Schmidt anticipated the public would be surprised to hear that the funds wouldn’t pay for filling potholes; Public Works Director Jim Karch said the money for that work comes from the city’s general fund. Alderman Scott Black introduced the motion to table the vote. Gleason said he and city staff will draft a memo to aldermen addressing their concerns and hopefully clarifying which projects an “asphalt and concrete” line item would include. and $250,000 saved by reorganizing the city’s public works and water departments. City Manager Tim Gleason said the city will begin a national search within a few weeks to replace retiring Bloomington Police Chief Clay Wheeler. Bloomington Police Chief Clay Wheeler addresses aldermen. Wheeler announced Friday he would retire after just a year on the job, citing his wife’s cancer diagnosis and a desire to spend time with family. 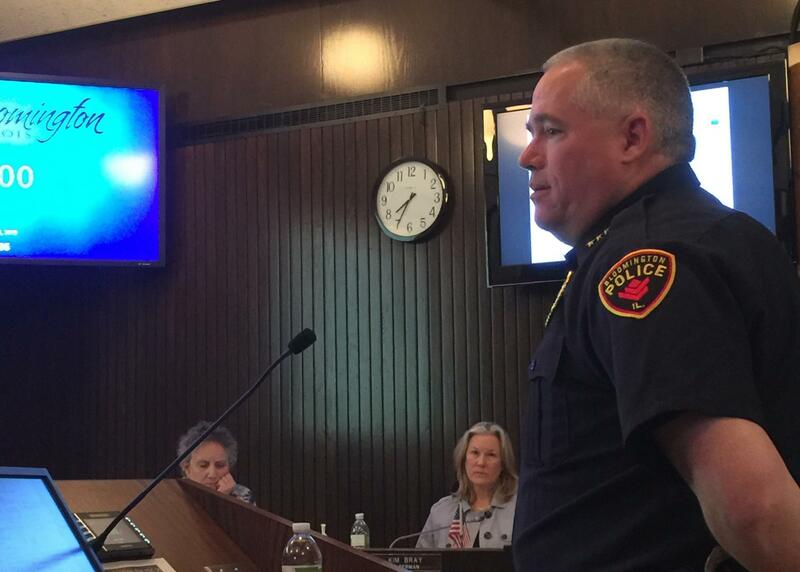 Gleason announced plans for the search following Monday’s city council meeting. He noted there is some interest in the position from within the department. Gleason also said he sees “no need” to hire a consultant to conduct the search, but expects the city will spend a couple hundred dollars to advertise the opening with organizations such as the International Association of Chiefs of Police. “I wish the timing was better,” he said, noting there are still some initiatives he will work to accomplish before his departure June 21. Wheeler also pointed to two recent murders that remain unsolved. “There’s no doubt in my mind that there are people out there that know what happened, and I want to plead for them to come forward so that society can say, in our community that’s not acceptable,” he said. Whether or not that happens during his remaining time on the force, “You have an outstanding police department full of very capable people,” Wheeler said. Bloomington is looking to boost spending 8 percent in the next budget year, with a major emphasis on what the city officials say are long overdue capital projects. Bloomington Police Chief Clay Wheeler said Friday he plans to retire in June after just a year on the job, citing his wife's cancer diagnosis and a desire to "go enjoy life."